From a warfighter’s stance, the 2018 Nuclear Posture Review changes the strategic environment as a threat-based approach, the commander of U.S. Strategic Command said here today. 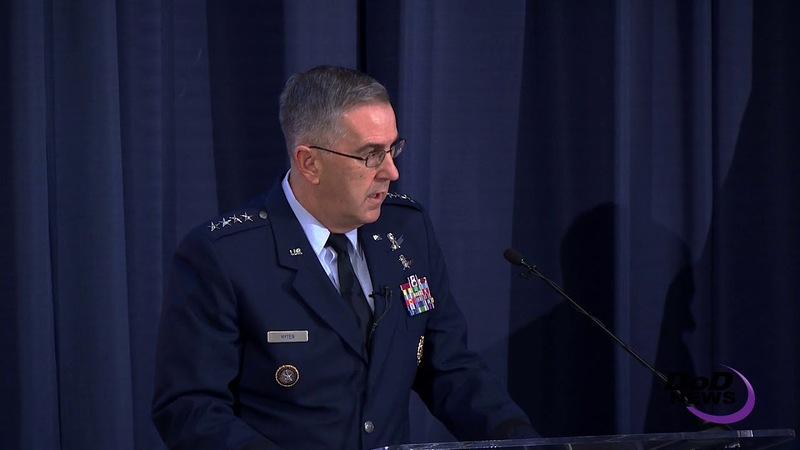 Air Force Gen. John E. Hyten delivered the keynote address at a seminar on the posture review at National Defense University’s Center for the Study of Weapons of Mass Destruction. The 2018 review is the Defense Department’s fourth review of U.S. nuclear policy, posture and programs since the end of the Cold War. The strategic environment has significantly evolved in the past two decades, Hyten said. “Our adversaries are building and operating these strategic weapons, not as a science experiment, but as a direct threat to the United States of America,” he said. The strategic environment is dynamic and changes constantly, the general said, noting that the U.S. approach to deterrence must be equally dynamic to address such threats. “This tailored deterrence approach requires us to have flexible capabilities that include a broad mix of yields and modernized platforms to credibly deter the spectrum of adversaries and threats we face today and in the future,” Hyten said. As the Defense Department evaluated its nuclear posture in light of the threats the United States faces, the department found the posture is strong today, he said. “We have everything we need to address the threats of today,” he told the seminar audience. The best way to prevent conflict is to be prepared for it, Hyten said -- to be prepared to impose unacceptable cost and deny any benefit that any adversary may perceive. That, he said, is deterrence. The Nuclear Posture Review defines and expands on what hedging against an uncertain future means for nuclear weapons, Hyten noted. That requires an agile, adaptable deployed force and a responsive infrastructure, which requires trained, educated men and women dedicated to the mission and postured for success, the Stratcom commander said. It also means having the flexibility to adjust the force with new capabilities and acquire systems quickly, he added. 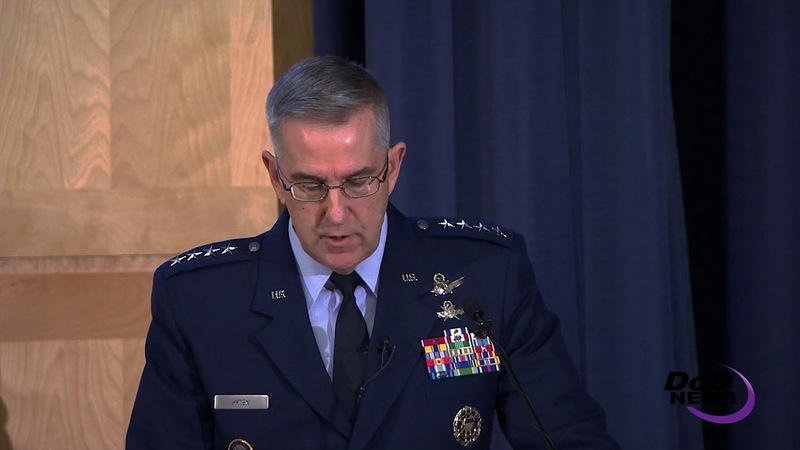 “Our deterrence force is strong, powerful and ready, but the pace of change in the strategic environment is rapid and demands that we adapt how we operate in order to stay ahead of evolving threats,” Hyten said. “And, if we're not careful, I'm afraid, 10 or 20 years from now, our deterrent capabilities will be at risk. The United States cannot let that happen, he said. The DoD budget, requirements, acquisition and testing processes are all too slow, he said. The solution, he said, is to get away from a culture that is risk-averse and empower people to move fast once again. “First, we need a budget,” he said. “It's a critical enabler for everything else. I was encouraged last week, when Congress agreed to a defense budget framework that provides stable funding for the next two years. That would be huge. DoD also needs a test process that is efficient and also moves fast, he said, and operators need to understand how to take operational risk and be given the opportunity to do so when it comes. “We need to empower commanders to take logical risk about how to employ weapon systems [and] how to accept weapon systems,” Hyten said. “Our modernization efforts will not be successful if we only address one of the issues. We won't solve the problem. We need to fix all of these things -- budget requirement, acquisition, test, risk -- if we're to make a difference.